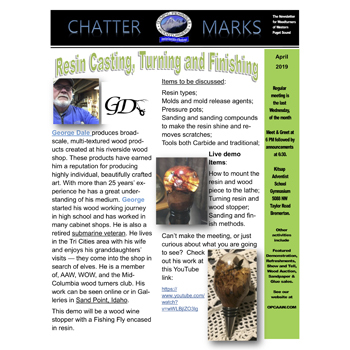 Our chapter of the American Association of Woodturners comprises more than 120 members of all skill levels from Kitsap, Mason, Jefferson and Clallam counties in Washington State. Our more experienced members place a high priority on helping novice turners in a variety of ways including an official mentoring program, casual advice, and hands-on workshops. We have still have a few spots open for the Stephen Hatcher workshop in May. 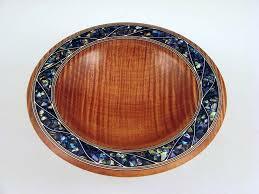 It will be a two-day event with Stephen teaching us how to inlay crystals/resin and how to complete the turning after the resin dries. The full group of 10 participants will be split into two groups of five. The first group will meet on Monday, May 20; the second on Tuesday, May 21. Both sessions will be at Stephen’s studio between Olympia and Shelton. Stephen will provide a handout on what we need to turn before the first session. All 10 students will come together on Saturday, May 25 at Ray Ewing’s shop in Port Orchard for the final day of the workshop. The cost is $200 for the two-day event, plus a materials fee based on how much you use. If you are interested please sign up at our meeting on April 25 or contact Brad Stave. Join us for a “Meet the Turners” reception to celebrate the first (might it be the first annual?) OPCAAW woodturning show at the Sydney Art Gallery in Port Orchard. Refreshments will be served. The show includes more than 40 entries of turnings made by club members in categories for pen turning, spindle turning, bowls, hollow forms and segmented turnings. At the reception, a $150 “Best of Show” prize will be awarded, as well as a $75 second prize and a $50 third prize. Judging will be done noted Olympia woodturner Stephen Hatcher. The show runs through April 24. Our chapter of the American Association of Woodturners comprises more than 120 members of all skill levels from Kitsap, Mason, Jefferson and Clallam counties in Washington State. Our more experienced members place a high priority on helping novice turners in a variety of ways including an official mentoring program, casual advice, and hands-on workshops. Top regional turners such as Molly Winton, Stephen Hatcher, Art Liestman and Don McIvor and accomplished club members such as Tones Briggs, Norm Hix, Dan Marler and Brad Stave have conducted demonstrations at club meetings in the past few years. Maintain a lending library for members. Membership in OPCAAW is $30 per year for an individual; $50 for a family. You can apply for membership or members can renew your membership for the new year online. There are many benefits of membership. 6:00 pm – 9:30 pm, May 29, 2019 – Regular Meeting - Stephen Hatcher: "How Did You Do That?" We use Facebook to get information out quickly to our members, such as the availability of free wood or wood to purchase, and also as a help forum for members with questions about woodturning. Check out our Facebook page and like us on Facebook to stay in the loop.